Then fill in the rest of the schedule: together time, solo play time for your child, and lots of physical activity – I’d recommend a minimum of an hour a day of physical activity, but more is better. Build in hygiene habits (hand-washing, tooth-brushing), and clean-up times. If there are chores that need doing, put those just before a favorite activity, so they always know that as soon as they finish their clean-up they get to play. If you have a child that wakes up earlier than you want to be up yourself, then make a basket of “quiet morning toys” for your room, and set limits on how/what they can play early in the morning, and how they know when it’s OK to transition to louder morning activities. If you have a child who will sleep late and who you have to wake up, go ahead and spend time taking care of yourself, and getting yourself ready for the day first. Then put on some cheerful morning music, start with morning hugs and kisses, and read a few stories together to start them on their day. Morning routine might include getting dressed, breakfast, brushing teeth, feeding the dog… try to do the same activities in the same order, each morning. You could make a small flip book showing the steps in morning routine. Hang it on their doorknob. They can walk themselves through it each morning. Along the way, you can offer choices, but only offer simple options that you can live with, and keep the number of options small. A good rule of thumb is to take their age plus one: so, a one year old would be offered two choices: red shirt or blue shirt? If you notice that every single morning, you’re stressed and yelling “hurry up”, start a new habit: do some work the night before to lay clothes out, prep some food, and so on. Also, whenever you return home from an outing, re-pack your diaper bag or whatever else you know you’ll be taking with you the next time you leave. Set an alarm on your phone for ten minutes before you have to leave. 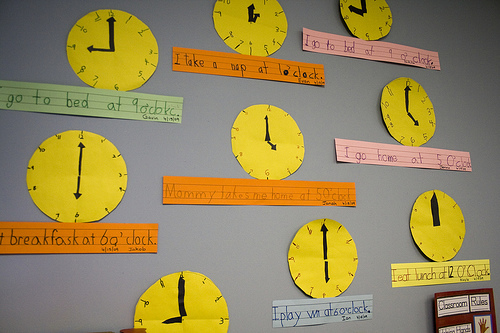 When it goes off, remind your child of the steps they need to do to be ready on time. Tell them they can have a few more minutes of playtime, then you’ll start the leaving-the-house countdown. While they have their playtime, you get all your things ready to go so you can give them your full focus in those last few minutes. Two minutes before time to go, do the final steps of shoes, coats, picking up your bags and heading out. A “typical” one-year-old needs about 10 – 13 hours of sleep at night, and one or two naps (a total of 2 hours of nap.) A typical two-year-old needs 9.5 – 12 hours a night, and one nap (1.5 – 2.5 hours). To settle your child down, try an abbreviated version of the bedtime routine. If he falls asleep, let him go till he wakes himself. Don’t feel like you have to wake him to be sure he’ll sleep at night – good naptime sleep begets good night-time sleep. If your child won’t sleep, you can still enforce a quiet time in their room. Be very matter of fact that they must stay in their room for a certain amount of time, and can only get up when you say it’s OK. If you are consistent every day, they’re less likely to fight it. If they learn that sometimes you let them get up early, they’ll fight for that every single day. If dinner prep time is hard every day, then plan for it! Have an activities basket that only comes out at that time (keeps it special). Involve your child in meal prep. Give yourself plenty of time to get things done with toddler distractions. Planning out meals in advance can make this time less stressful. More mealtime tips here. Start your bedtime routine before the first yawn. Lots of kids will go from tired-but-not-yawning to yawning to overtired-wild-child if you wait too long. Start winding down about a half hour before bedtime: dim the lights, turn the temperature down in the house so they want to get under their snuggly blankets. Turn off all screens, for you and them. Consider a bedtime snack and/or a bath. About ten minutes before bedtime, start final steps: pajamas and stories. Set clear limits on time and number of activities. Again, if kids learn some nights you’ll read 5 stories, they’ll ask for 5 every night! Think about having multiple sleep “cues” that help cue your child to settle down but don’t let them become sleep “crutches” without which they can’t sleep. For example, your child might usually have: bedtime music, bedtime story, pajamas, and favorite stuffed animal. But not always all of them… that way if one night you can’t find the stuffed animal they can still sleep. Or if you’re travelling, and forgot pajamas, they’re still able to fall asleep in their clothes. Make changes to routine gradually. If you know a big change is coming, talk about it beforehand. This entry was posted in Parenting Skills and tagged nap, parenting, routines, toddler on April 14, 2014 by Janelle Durham.